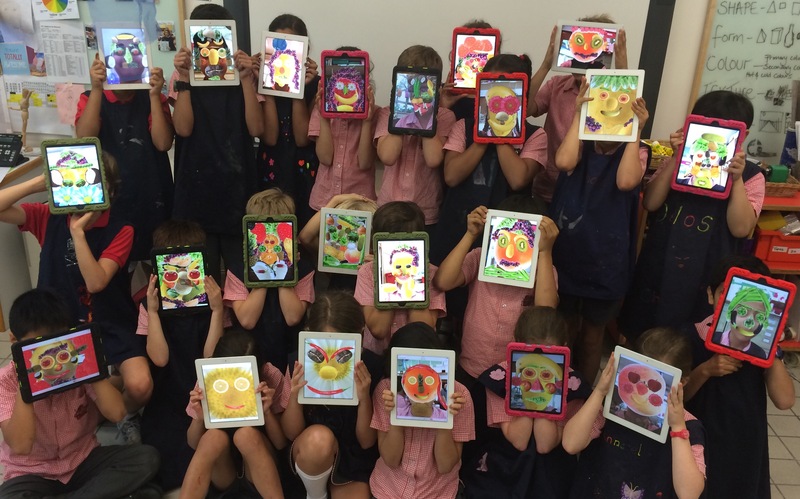 iPad Art Room » Do You Really Need To Keep All Those Photos and Videos? Do You Really Need To Keep All Those Photos and Videos? 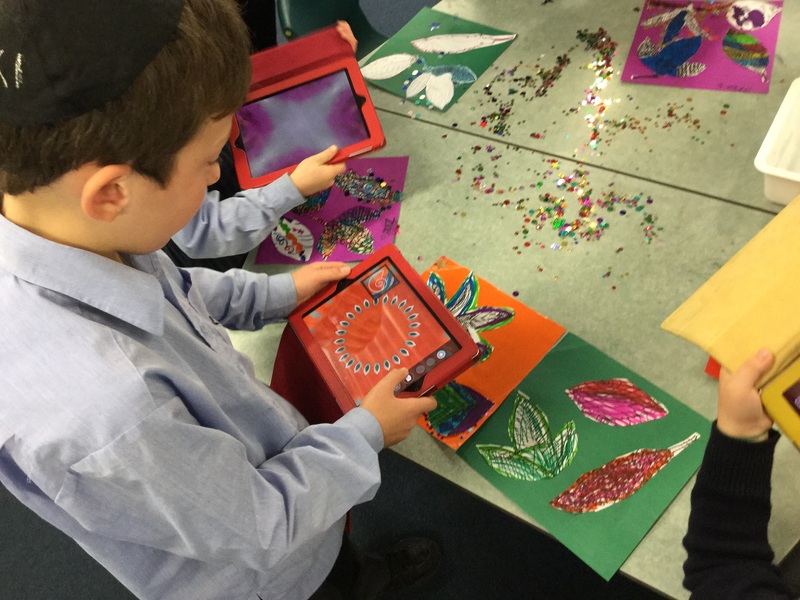 Using iPads in the classroom probably means that your students will create a lot of imagery! This is a great thing, but do you know how to manage that never-ending stream of photos and video? Through my experiences in schools across a variety of contexts I’ve learned that if we don’t share really practical and productive ideas for managing these ‘housekeeping’ issues, we run the risk of building barriers, not bridges, towards truly integrated pedagogical approaches to learning. How do you manage the never-ending stream of images and video created on mobile devices by students in your classroom? I constantly ask the teachers I work with to audit their strategies for collecting and keeping digital artefacts, because with access to digital cameras, and an iterative approach to learning that involves content creation through photography and film-making, well, they make a lot of stuff! Sometimes, it IS vital (or a requirement) that this work is preserved as evidence of outcomes, but do we have to keep everything? All the time? I don’t think so. In a digital world, students can produce huge volumes of media and it is impractical (maybe impossible) to preserve it. I believe we need to become comfortable with that. It starts with actively moving past the routine of ‘saving everything’ because ‘that’s what we’ve always done’. We have to let go. Ask yourself what is truly necessary for record keeping, and most importantly, what should I keep that has value for learning. That’s where time and effort should be focused. Time, Space and Sanity Savers! When you do want to collect and keep work that your students have produced, there are so many ways you can get it off their screens. Sure, you can use email, connect kids to apps and platforms that are all about submissions and digital folios, but this post isn’t about that. Here are some tips, tricks and workarounds that I use in classrooms to collect, keep and share student work. And they’re all built on the idea that digital products can be viewed and saved quickly and easily while they are still on student screens. Asking young students to sit in front of me, I may ask them to hold their iPads up in the air and I will step in to create a close-up shot that’s being broadcast to the whole group in real time. Simply connect your own iPad to a projector, jump into the camera app and you have a ‘live feed’. 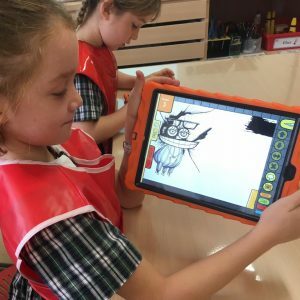 Often kids are so excited to see their work being shared and displayed on the ‘big screen’, and may consider this informal exhibition a really powerful affirmation. Of course, you can extend on this and record this moment – it is as simple as pushing the red button. The big bonus here is that you can capture the student’s product on screen, and also pan around and create some context for the learning through all the students faces and commentary. It’s also easy to collect up all the screens for viewing as a ‘floor gallery’, like the one you see below. In this example, I was using the live camera to share the images with the whole class on the screen, and taking photos at the same time. It’s really worth considering why and how we create classroom displays, and importantly, who we make them for. There’s a plethora of writing on this topic, but the point I’d like to highlight is that at times there may be no benefit to printing and displaying some work, particularly if creating the display is taken out of students’ hands or exhibited a long time after the work was created. Not everything needs to go up on the wall, and in fact, what does should be carefully considered. The immediacy of this approach also provides other opportunities. Getting a discussion going moments after completing a task may mean that student interest in reflecting on their work and sharing their ideas is at a peak. With a lesson design to match, this approach can really demonstrate the idea that the process, not the product was most important in this learning task. Interestingly, students who are more reluctant to share can feel more supported though this informal exhibition context. Putting work out there to the class in an ‘on-screen state’ can be used as a way to support creative confidence, with opportunities to extend on work, or improve a ‘finished’ product after viewing and critique is provided. Again, if I want to share the students work more individually, I can do that by getting onto the projector and moving closer with my iPad. If I want to create a lasting record of the student’s work myself, I can hover my camera over the top of the screens and record. I can zoom in and out of the individual images to create a short video; a really efficient option for sharing the work of the entire class on social media, etc. Take a shot of the student holding up their image on screen for all to see! It sounds obvious, but it’s an under-utilised tactic. 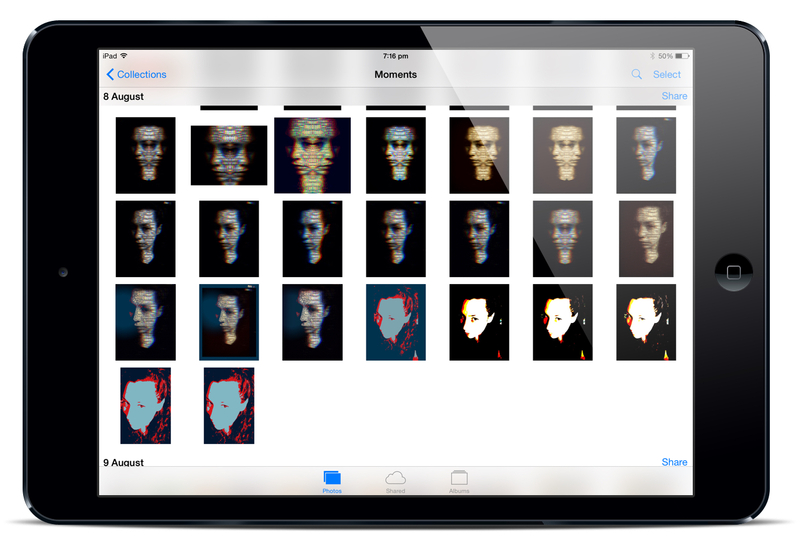 You’ll get a record of work, and the creator is also identified in a single image on your device. This may overcome the need to change file names or label. You can imagine that these sorts of images are also beloved by many care givers and friends. I often ask students to take photos of their peers using this technique, and then to AirDrop or email the image immediately to them. From there, I will sometimes ask the student to email or message the picture to someone who would like to see it. This can be a very powerful way of building relationships with caregivers, opening up opportunities to have conversation about the work of the purpose of the tasks, as well as building pride and creative confidence. You can also take a shot over a students’ shoulder as they work to capture more of the context for their learning. The image below gives a visual reminder and a sense of what the student was working on across a number of parts of the multi-step task. If you want to share works outside the classroom, but have worries about student faces in your images, these sorts of images are useful. You can go further and take group shots of students holding up their screens, even in front of their faces. Despite the lack of smiles in the example here, you can feel the energy in the room, get a sense of the learning taking place, and here’s the big win – ONE image can potentially be be used across all the students’ folio or records as a lasting record of the lesson. 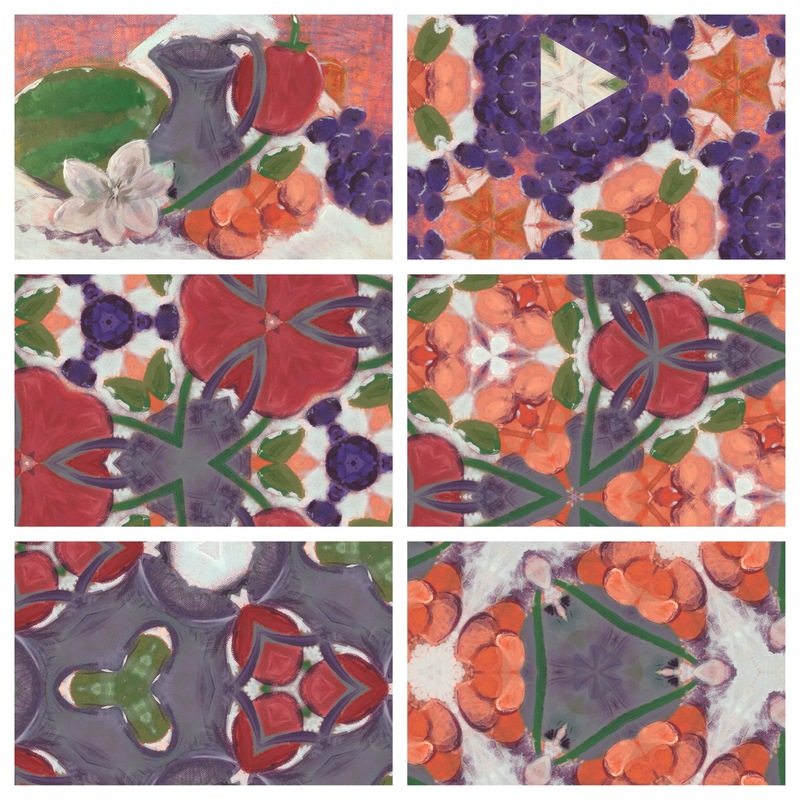 By encouraging art-makers to save work regularly, and to document their creative decisions with a screenshot or by taking a photograph of a work in progress, a trail of investigations that visually describe the learning is produced on their Photos app. Students can reflect on their journey at any time, and teachers can use the Photo app to support critique, delivering timely feedback to students using the camera roll as a reference. In this case, a screenshot of the image thumbnails (like the one below) can become a convenient way for students to record and share work. While large files are necessary when a quality viewing experience or a big print out is required, it’s not always the case. If I am recording progress, assessing practices, submitting folios etc, a single, smaller file can be an effective and portable solution that students can generate instantly with a screenshot. Again, a valuable, under-utilised approach to collecting and using multiple images. It’s also worth remembering that this image can have notations added quickly and easily through apps or the ‘Mark-Up‘ feature in the Photos app. With this tool you could ask students to circle their final product, highlight a particular breakthrough, etc. In a similar vein, how about asking students to create a digital collage if they are going to submit work to you or print? In this way, multiple images can be combined with a few swipes, and you have one document to collect or print or share from each student. Sure, you could combine images in a multitude of other ways too, but this is an efficiency solution as most students are comfortable with these apps, and they can make more complex products with them too. If I ask students to use this method to ‘hand up work’, it’s usually because I’d like them to spend as little time as possible doing the formatting for this. It can be helpful to suggest a plain white background, and to avoid crazy cropping. 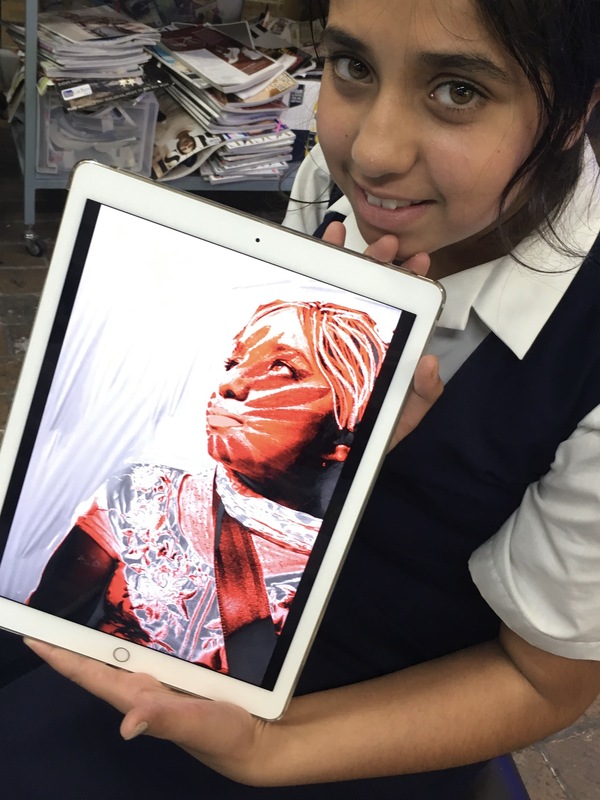 In visual arts, students often need to use a physical sketchbook to collect up images. If they need to print for this purpose, it’s often useful to use the ‘window’ style template to arrange 4 photographs on one A4 page that can go straight to the printer. My favourite collage app for younger students is PicCollage Kids, but if your students have their own devices they may have their own already installed. IDEA 5. If You Can’t Save It… Do It Anyway! I have worked in schools that have no easy way of getting works off devices. Students have no email, the iPads are not connected to Wi-Fi in classrooms, etc etc. There are solutions, but even if there weren’t, I’d say, ‘do it anyway’. Do the animation of the talking frog for the onomatopoeia lesson. 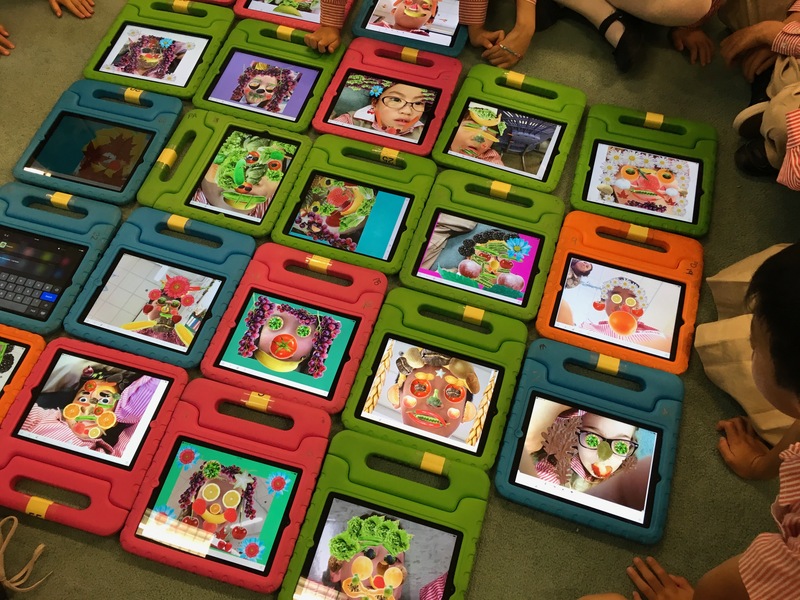 Do the digital portrait using food for the healthy eating lesson. Do the ink blot monsters. Do it all… if the tool supports your students to achieve their learning objectives. Sure, it would be great to have the option to share off individual devices, but if other positive aspects of a task outweigh this one barrier, don’t abandon those opportunities. Use the strategies above as ‘workarounds’, and involve the students in discussions about why they are engaging with the task. Remember that students may also use photography and video as a stream of consciousness almost like a conversation, and some actually have no real desire to keep what they’ve produced ‘in the moment’. Have you got any great tips to help manage all those movies and images? We’d love to see you share them in the comments below! I can’t tell you how much I appreciate this article. The dealing with images has eluded me. You simplified it and made it so easy and clear in my mind, where it seemed so complicated before. I love the floor gallery, the pics of the students holding their iPad art, and taking screenshots of the Photo Gallery…all SO doable. Thank you for keeping it simple for me!